The University of Missouri-Kansas City offers up to two one-year neuroimaging fellowship positions. The fellowship, which is fully accredited by the Accreditation Council for Graduate Medical Education (ACGME), will meet or exceed all requirements for neuroradiology training, leading to a certificate of added qualification (CAQ) eligibility by the American Board of Radiology. 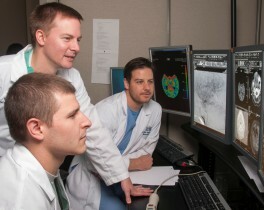 Neuroradiology fellows will gain experience in all areas of neuroimaging by rotations(adult and pediatric brain, ENT and spine imaging with experience in neuroangiography) at a diversity of hospitals, including Saint Luke’s Hospital (tertiary referral and stroke center and the largest interventional service in the midwest), Truman Medical Center (trauma and indigent care) and Children’s Mercy Hospital(pediatric neuroimaging). Interested applicants may apply for a second year of additional training in neurointerventional. Fellows will develop skills to confidently perform neuroradiology and neurointerventional in both a clinical and academic environment. Fellows will participate in scholarly activities and be given graded responsibility for resident and medical student supervision and teaching. The primary goal of the UMKC/Saint Luke’s Hospital Endovascular Surgical Neuroradiology (ESN) fellowship program is to produce successful trainees who have demonstrated sufficient competence to enter ESN practice without direct supervision. ESN fellows will be provided with an organized, comprehensive, supervised, full-time educational experience in endovascular surgical neuroradiology. Fellows will learn how to care for and manage patients with neurovascular disorders, such as cerebral aneurysms, vascular malformations, and stroke. They will perform endovascular surgical neuroradiology procedures at Saint Luke’s Neuroscience Institute under close UMKC faculty guidance, with active participation carefully tailored to their learning curve and growing technical ability. The ESN fellowship program integrates endovascular surgical neuroradiology techniques into the comprehensive clinical management of patients. The fellowship duration is 24 months, with at least one month rotation in the following clinical services: Neurology, Neurosurgery, Neurointensive care. Tight collaboration between various subspecialties, including neurosurgery, neurology, neuroradiology, ophthalmology, and otolaryngology will be emphasized in order to optimize management options in an environment that relies heavily on multimodality and collegiality. The Pediatric Radiology Fellowship Program at Children’s Mercy Hospital (CMH) offers three one-year fellowship positions sponsored by the University of Missouri-Kansas City, which are all approved and accredited by the Accreditation Council for Graduate Medical Education (ACGME). An optional second year of subspecialty training may be requested as well. 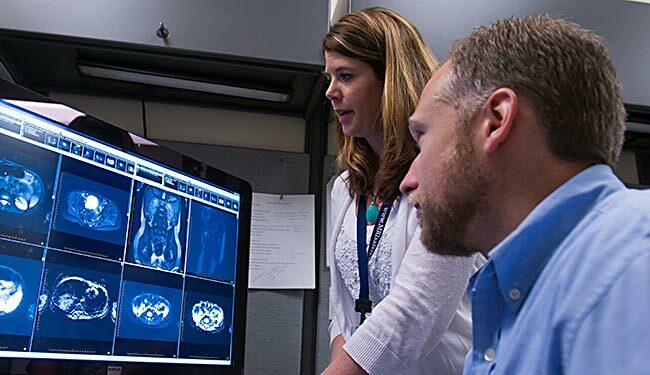 The fellowship program meets or exceeds all requirements for Pediatric Radiology training, leading to a certificate of added qualification (CAQ) eligibility by the American Board of Radiology.